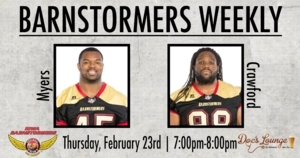 Join us at Doc's Lounge on Thursday, February 23rd for Barnstormers Weekly! We will be broadcasting LIVE on 1460 KXnO with Head Coach Dixie Wooten and special player guests DL Ra'Shawde Myers and DL Mark Crawford. Enjoy great drink specials throughout the show!